NO ELECTRIC BILL!!! WHAT?? That's right, no electric bill!!! Solar panels make this possible!!! Absolutely gorgeous Dunedin home!! Perfect for a first time home buyer or a Veteran. 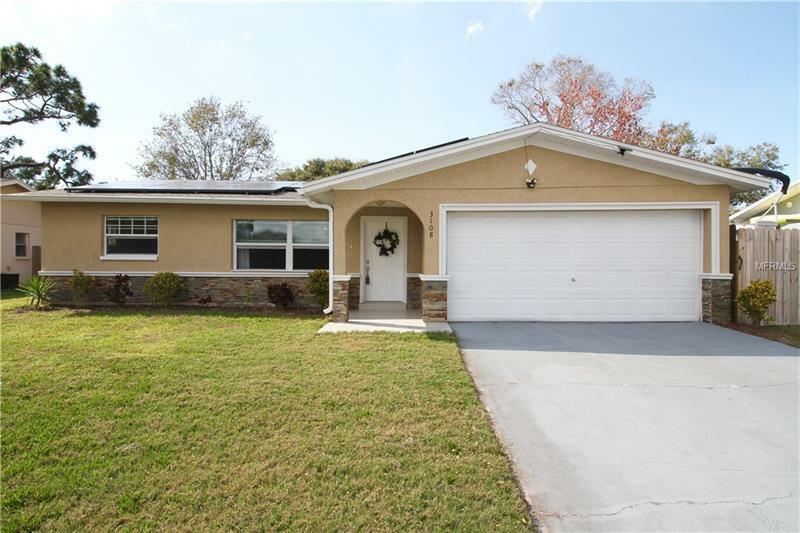 Close to beaches, Pinellas trail, shopping, downtown nightlife, everything Dunedin has to offer!! 3 bedrooms and 2 bathrooms in this split plan home. Completely renovated and updated with beautiful finishes! This home boasts lovely granite counter tops with dark wood cabinets and stainless steel appliances. Indoor laundry area. Crown molding throughout. Roof, A/C, water heater, all installed in 2016. Solar panels and new flat roof installed 2018. Side yard has an area big enough to store a pontoon boat out of view. Fire pit, and storage shed out in the backyard. Nothing left to do here!! It's all been done! THE ONLY THING MISSING IS YOU! !